Actually, for a triangle, a polyBLEP won’t work directly. 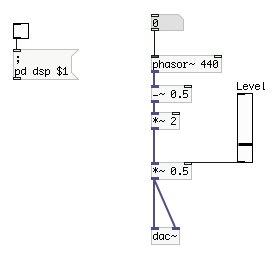 The polyBLEP corrects for a discontinuous change in amplitude. A triangle is continuous, but its first derivative is discontinuous. PolyBLAM is the correction to use (polynomial approximation to Bandwidth-Limited rAMp). 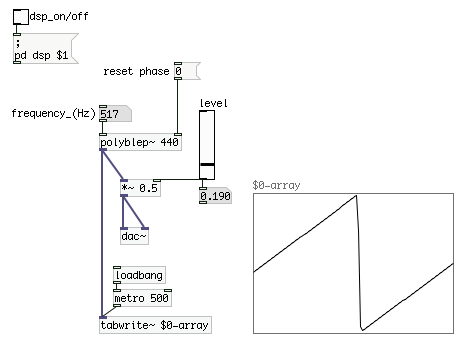 I just implemented polyBLEP and polyBLAM in my synth (not yet published) this weekend. I found lots of info for polyBLEP, but had to derive the polyBLAM polynomials myself. Here is the first order polyBLAM. h * (1-d)**4 / 6 for the sample after. h is the height of the discontinuity in the derivative. For example, if the previous slope was 0.01/sample and the following slope was -0.02/sample, h would be -0.02 – 0.01 = -0.03. This paper is where I got the polyBLEP polynomials. It has one tantalizing mention of polyBLAM. V. Välimäki, J. Pekonen, and J. Nam, “Perceptually informed synthesis of bandlimited classical waveforms using integrated polynomial interpolation,” Journal of the Acoustical Society of America, vol. 131, no. 1, pt. 2, pp. 974–986, Jan. 2012. Oops, that should be “d = T[current sample] – T[corner]”. To do a PolyBLEP on a triangle wave you use a naive square, apply the PolyBLEP to it as normal, and then integrate. This does produce a rather odd-looking triangle, however, so yes, it’s not totally adequate. I’ve not heard of PolyBLAM though. Thanks for the info on this. I will look into this more. 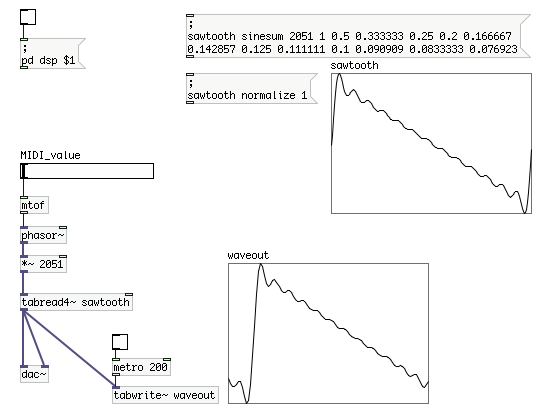 There are all sorts of interesting ways people are coming with to generate alias-free waveforms! Hey Christian, thanks for the write-up! I made a pd vanilla version of this patch for the enzien heavylib today based on your code (https://github.com/enzienaudio/heavylib/blob/master/hv_blepsaw.pd). It works surprisingly well! I hadn’t known about this method and will look into other polynomial corrections next time I get the chance. No problem! That’s awesome that you made a version for the enzien library based on this code. PolyBLEPs are surprisingly good given their relatively low computational cost. If you don’t already know about them, MinBLEPs are even better, but at an increased complexity and cost. Worth looking into though. Nice! Have you by any chance looked into generating impulse trains using similar methods? No, I had come across some talk on BLITs but as far as I can remember, it sounded like MinBLEPs were the better way to go, so I implemented that.